Natural Soy Products is based out of Brooklyn, IA. They are a smaller, more locally known company supplying soy based products. The products range from basic degreasers and cleaners to hydraulic oil, and everything in-between. 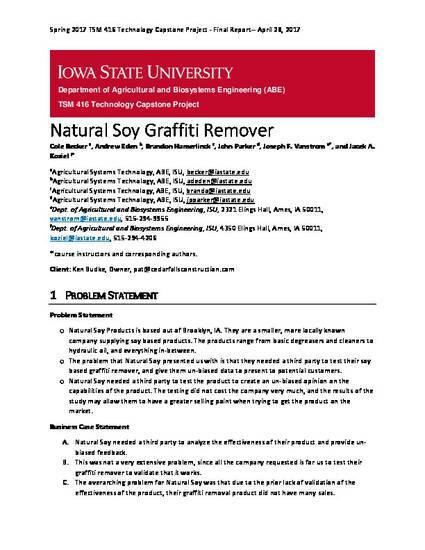 The problem that Natural Soy presented us with is that they needed a third party to test their soy based graffiti remover, and give them un-biased data to present to potential customers. Natural Soy needed a third party to test the product to create an un-biased opinion on the capabilities of the product. The testing did not cost the company very much, and the results of the study may allow them to have a greater selling point when trying to get the product on the market. Cole Becker, Andrew Eden, Brandon Hamerlinck, John Parker, Joseph R. Vanstrom, and Jacek A. Koziel. Natural Soy Graffiti Remover. Final Report. TSM 416 Technology Capstone Project, April 28, 2017.